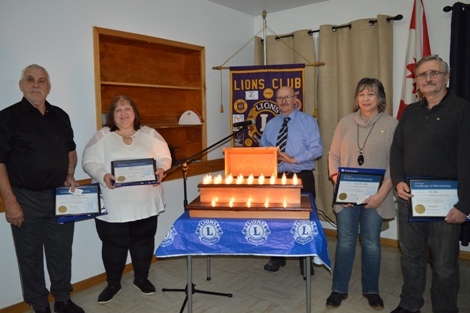 New Germany & Area Lions inducted four new members in January. shown left to right: Mellie Robar, Peggy Tufts, past Zone Chair Peter Wagner who performed the inductions, Penny Tippett and Alan Tippett. Welcome to the New Germany & Area Lions Club website. As president, it's an honor and a priviledge to work with each of the Lions in the club; it's not just one lion that makes the club such a success - each and every one of the New Germany Lions has made the club what it is today. It shows in the community and beyond that our Lions are unselfish in the time and energy they donate to the people in our area. I'm proud to be the president of this wonderful club due to all the support that has been given to me. United we will climb the mountains and reach the peak. We will accomplish our goals as we work together and repect one another as lions . Lions Radio Bingo can be played every Wednesday evening from the comfort of your home! Tune in to CKBW radio at 7:00 pm to hear the numbers being announced !